This year’s ride took the same general route as last year’s groundbreaking challenge, but with some new ‘tweakings’ e.g. a new route for the second half of the first day for the 6-Dayers, from Dingé to Rennes and a new route from Vitré to Laval on the second day, as this year we didn’t divert on the punishing route via Gorron. This resulted in three 50 miles or so days in succession, which was welcomed by some, but not so much by the keener riders! However, the morning route to Chateau Gontier, where the 3½-Dayers joined us, couldn’t have been criticized for its lack of hills! The weather on the first three days was just lovely for cycling – not too hot and little wind – but that was all to change over the next three days. 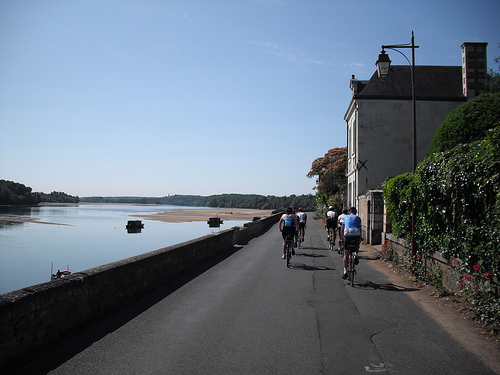 The flat 80 miles from Angers to Tours on the fourth day, along the Loire valley (with no-one getting lost this year), was absolutely beautiful again, but baking, with the temperature reaching 105F (35C I think!). In the middle of the afternoon, I had to look after a cyclist who came off her bike on a curbstone, with some abrasions and concussion and our group had to endure waiting for an hour for the Sapeurs Pompiers to arrive and treat her, in the heat, with water running low. The support was stretched a bit, so 17 miles later, with no bars in between, I was able to replenish my water and given a cold gin and tonic from Pete Alloway’s support van, to calm me down! As we started to go north for our last couple of days, the predicted weather forecast of poor weather came true and we had wind and showers on a regular basis, making it a bit of a struggle at times. 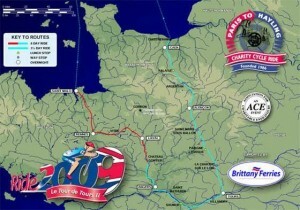 The 95 miles from Tours to Alencon on the Friday tested most of us and we were glad to get in. Saturday, the final day, was Fancy Dress Day and the outfits, worn by at least half of the riders, one way or another, were great fun. There were the Hell’s Belles, the House of Cards, coincidentally joined by the Four Aces, the Busy Bees, the Lady Birds and many more, but our favourites were the Morris Men, led by Hayling’s Dr Turner. We had an extra few miles, making it a 75 mile day to Caen, because a new motorway was being driven through our route, fortunately foreseen by our final recce three weeks before the ride. So, after a few celebratory drinks as we reached Caen, it was up to the Castle, in what finery we could muster, for the last night dinner party and dancing until too late!. Next morning, after a committee meeting to decide the awards, we all cycled the 12 miles or so to the Ouistreham ferryport, via Madame Gondrée’s café, to board the Seacat and a rather tempestuous crossing back home. The Bike Ride Awards were presented to those deserving with great acclaim and we were treated to an Ode to ‘Tour de Tours Nights’ by Magnus MacFarlane. We emerged from the ferry, now all dressed in our new T-Shirts, on the back celebrating Mike Burras’s ‘30 Years in the Hole’, to cycle to the Hayling Ferry, with a wait for many as we were shuttled across. A welcome at Hayling College awaited us, hosted by HUFC, as we met up with our loved ones and collected our bags, glad to be home, but having memories of a great ride, yet again.